What is the rotational kinetic energy? How to calculate the rotational kinetic energy? 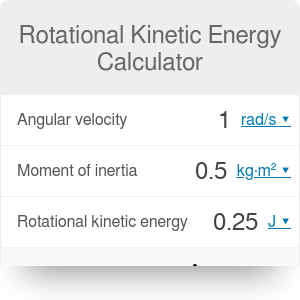 This rotational kinetic energy calculator is a tool that lets you determine the energy of a rotating object, such as a wheel or a carousel. In this article, we will provide you with all information you will need to make your calculations, including a rotational kinetic energy formula. We will also show you how to calculate rotational kinetic energy, illustrating the guidelines with a step-by-step example. Rotational energy is a form of kinetic energy. It describes the energy of an object in motion. While regular kinetic energy was related to objects moving along a straight line, the rotational energy is linked with objects that are rotating. This is why, instead of a regular speed, we have to use angular velocity in our calculations. Remember that if an object is both in translation (moving along a straight line) and rotation (turning around its axis), it has both regular and rotational kinetic energy. Therefore, to find out its total energy, you need to calculate both values and add them. RE is the rotational kinetic energy, expressed in Joules. I is the moment of inertia of the object, expressed in kg*m². ω is the angular velocity of the body, expressed in radians per second or in Hertz/RPM (revolutions per minute) after the appropriate units conversion. If you're not sure how to calculate this value for a body in rotary motion, head straight to our centrifugal force calculator to find out. Let's analyze the following example together: a wheel of radius R = 0.5 m and mass M = 1 kg is rolling along a track, making 30 revolutions per minute. What is its rotational energy? First, we need to determine what is the angular velocity of the wheel. We know that it is equal to 30 RPM, what is equivalent to 0.5 Hz. We have found that the rotational kinetic energy of the rolling wheel is equal to 0.03125 J. Rotational Kinetic Energy Calculator can be embedded on your website to enrich the content you wrote and make it easier for your visitors to understand your message.